A robust, very leafy perennial with milky juice, which reproduces by seeds and by horizontal roots. 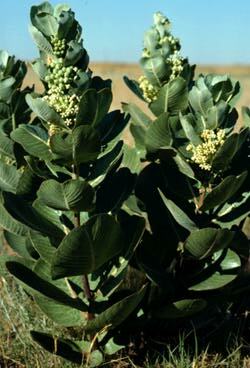 There is 1 stout, erect stem, often hollow, unbranched or few branched, 1 1/2 to 3 1/2 feet high. There are 5 or more pairs of large thick oval leaves, conspicuously veined, almost stalkless, often as broad as long, and rarely more than 1 1/2 times as long as broad, the tip broadly rounded and often indented. Manitoba to Minnesota, south to Texas and westward to British Columbia and California. 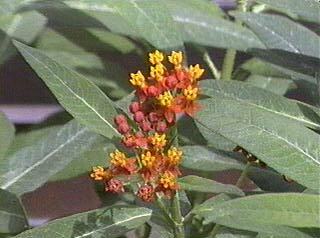 Showy milkweeds have a stout stem and grow up 3 to ­6 feet tall. 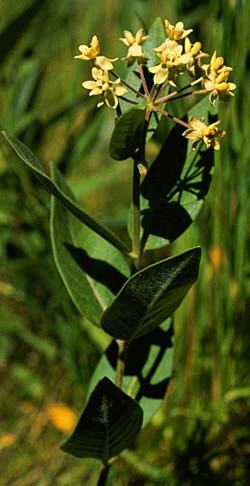 The stem and undersides of the leaves may be coveredwith dense white hairs. Leaves are opposite and oval in shape, 1-6" across and 2-8" long. 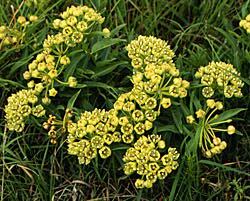 An erect bushy, hairless perennial with milky juice, which reproduces by seeds and by wiry, creeping roots. 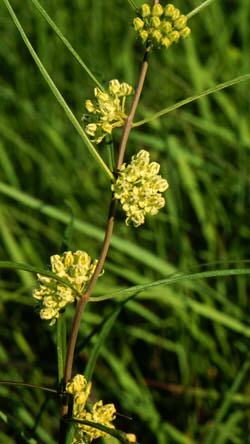 There are many slender unbranched stems 1 to 4 feet high, arising close together from the horizontal roots, giving large plants a shrubby appearance. 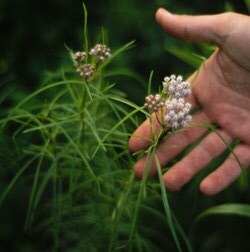 Three (sometimes 2 or 4) long narrow leaves are found in whorls at each stem joint. These are 3 to 5 inches long, nearly stalkless, not over 1/3 inch broad and usually less, with the edges slightly rolled backwards. 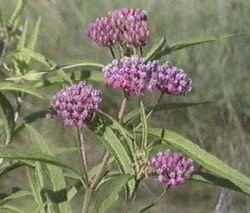 Small pinkish-purple flowers are produced in clusters at the top of the unbranched stem. 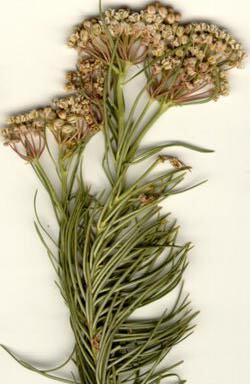 Flowering occurs in June and July. Seeds are borne in pods and are attached to a silky fiber. When the pods open in September and October seeds are readily carried by the wind. Seeds float, so runoff and irrigation water spread the seed. The seed can survive three years of burial in the soil. New plants readily become established from seed in areas free of other plant competition. 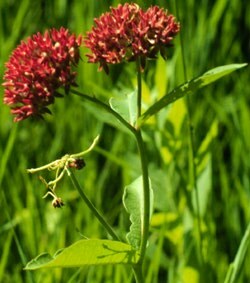 Common milkweed becomes a perennial (capable of reproducing from its root system) approximately three weeks after seedling emergence. 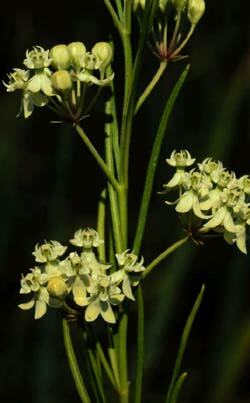 Green milkweed is perennial from a vertical rootstock. 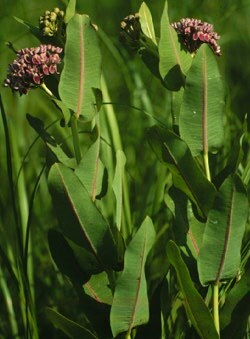 Stems are mostly solitary or in pairs, and are up to two feet tall. Leaves are usually opposite, up to four inches long, and extremely variable in shape. 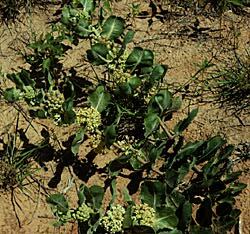 Plants from dry sites tend to have long narrow leaves, whereas those from moist sites are nearly round. 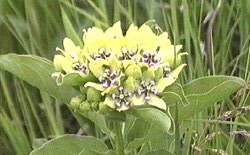 About 20-80 pale green flowers occur in clusters. 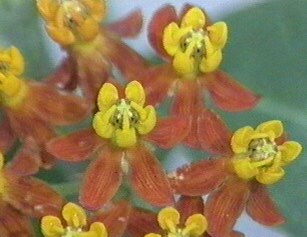 These are about two inches in diameter and are found in the upper leaf axils. 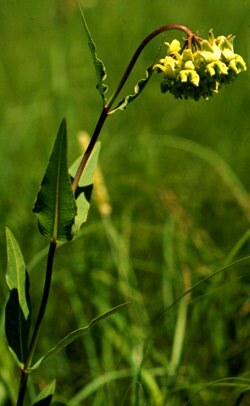 Look for green milkweed on dry hills or slopes in sandy or rocky native prairie or dry upland woods. 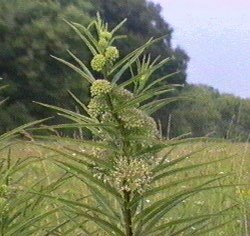 The plant has been found under all grazing regimes.